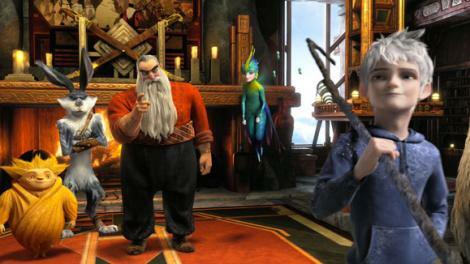 Rise Of The Guardians (2012) – Winning. Words. DreamWorks Animation gets the last laugh with Rise Of The Guardians, though. Their latest CGI adventure is a glittering yuletide yarn that just about overcomes its gimmicky concept. Following on from the successes of How To Train Your Dragon and the Kung Fu Pandas, ROTG warps traditional fairytales as childhood ‘Guardians’ North (ie Santa, voiced by Alec Baldwin), E. Aster Bunnymund (Hugh Jackman) and Tooth (Isla Fisher) unite against nightmare-spreading boogeyman Pitch (Jude Law). Notions that this is basically a Christmas version of Avengers Assemble, though, prove unfounded. With its watery opening shot of soon-to-be-Guardian Jack Frost (Chris Pine) drifting in icy purgatory, it’s more like a kiddies Bourne Identity. As Frost battles his amnesia and becomes an action hero, all that’s missing is Matt Damon ramming pens into unfortunate places. Also missing, sadly, is a script that really gets its larger-than-life characters interacting with each other. Despite all the rampant, twinkly magic, there are few sparks flying between our motley crew. The best exchange comes when everybody clambers into Santa’s pimped-out sled. “I hope you like loop-the-loops,” the jolly fellow bellows. “I hope you like carrots,” mutters Bunny. Visually, things are bright and crisp as Christmas morning. With Guillermo del Toro on producing duties, ROTG looks a million bucks. The 3D jerks to life inside Santa’s toyshop, a banquet of background detail, while the sorcery-infused battle scenes swoop, sparkle and occasionally terrify. The pacing also takes no prisoners – Guardians is like an OCD moppet hopped up on Haribos, which is both a positive and a negative thing. From its mysterious opening gambit right up to its firecracker finale, there’s no fat to be found here. Even Santa’s now a brawny Russian with bricklayer’s forearms. At the midway point, big red stops to reveal what makes him tick: wonder. He wants to be awed by things. Rise Of The Guardians takes that philosophy as gospel. It’s a film so desperate to have us gawping at its pretty visuals that it forgets to craft its story with the same amount of care.